Viewfinder is a NICVA survey which focuses on issues affecting the voluntary and community sector. The survey is disseminated to NICVA members approximately four times a year. The third Viewfinder of 2016 focused on the impact of Brexit on the Voluntary, Community and Social Enterprise (VCSE) sector. The Viewfinder was circulated to NICVA members (n=990) using an online survey platform between 3- 28 October 2016 and achieved a response rate of 27% (n=262). Key findings from the survey are presented below. A high proportion of respondents (77%) stated that they had concerns about the UK’s decision to leave the European Union. Respondents were asked to select their main concerns about Brexit from their organisation’s perspective. 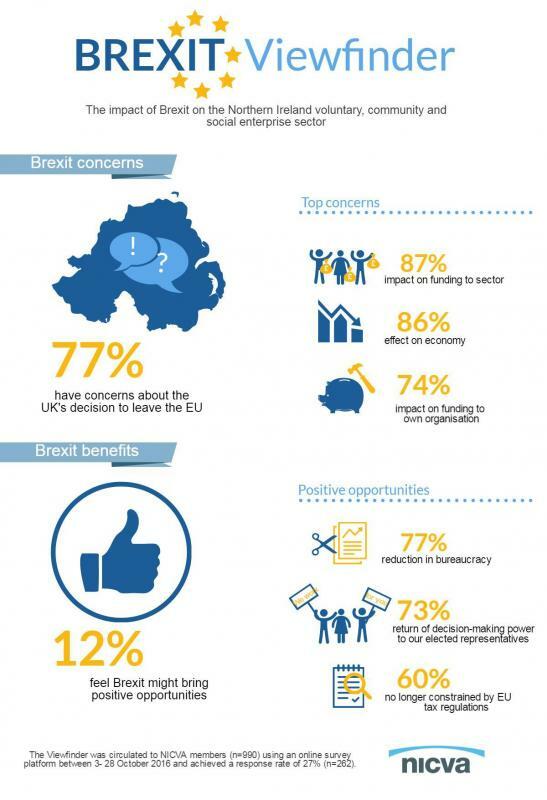 The top three concerns included: ‘the impact Brexit will have on funding for the sector’ (87%), ‘the effect Brexit will have on the Northern Ireland economy’ (86%) and ‘the impact it will have on funding for my organisation’ (74%). A full table of results for this question is presented below. Just 12% of respondents stated that they felt Brexit might bring about positive opportunities for the VCSE sector. The main positive opportunities identified by respondents (n=31) included: ‘the sector will benefit from a reduction in unnecessary amounts of red tape and bureaucracy that the EU imposes’ (77%), ‘the sector will benefit from the return of decision-making power to democratically elected representatives’ (73%) and ‘the UK government will no longer be constrained by EU tax regulations’ (60%). A full table of results for this question is presented below. A high proportion of respondents stated that EU policy priorities had been good for the VCSE sector (75%) and many were concerned that Northern Ireland will be less able to influence global policy following the UK’s departure from the European Union (67%). Respondents to the Viewfinder survey were concerned about Northern Ireland’s involvement in the Brexit negotiations, with 83% stating that Northern Ireland will not have priority in the UK governments Brexit negotiations. In addition, 83% stated that political disagreements in the Executive will weaken Northern Ireland’s position in Brexit Negotiations. Just over one-quarter (28%) of respondents stated that their organisation was involved in a European Union network or project. These projects and networks included Peace III and IV, European Social Fund projects, Erasmus, Eurochild and Interreg. Over one-tenth (12%/ n=31) of respondents stated that they currently received funding from the European Union. The average amount of total EU funding received by these organisations was £1,505,330. On average organisations received funding for a period of three years. The European Social Fund was the main funding source identified by respondents. A high proportion of respondents (63%) stated that they did not feel fully informed about the implications of Brexit. A small proportion of respondents stated that they felt fully informed about the implications of Brexit (17%/ n=45). These respondents identified the media (80%), politicians (42%) and NICVA (42%) as their main sources of information. Results to this question are presented below.